The sun shines brightly above Brad Meyers as he completes another radical move in the walls of the Canyon. 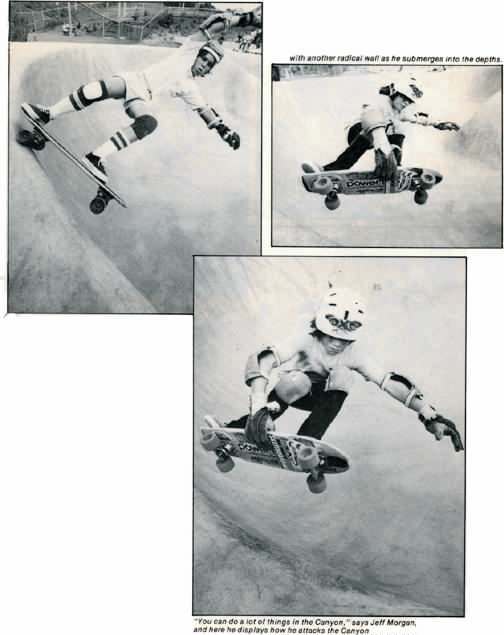 This pic was scanned from an old copy of Wild World of Skateboarding dated June 1978 and is displayed here for educational purposes only. The full story was written by Richard Taylor. Photos by Don luczak. 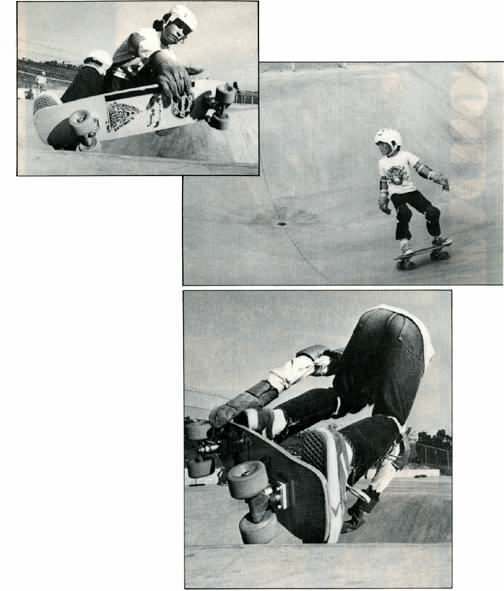 c. 1978 by Wild World of Skateboarding Magazine, or affliated groups. Challenging the Grand Canyon at Aloha Skatetown, Brett Ross (below left )prepares to head into another vertical wall after getting high on a 15-foot vertical bank. The atmosphere around the park, which is also open at night,. is nothing but the best. It undoubtedly lives up to what a park should be-it's not just a slab of cement. It has an Aloha Surf Shop. a Sega Center arcade, picnic areas. viewing patios and a snack shop. It also gives spectators an opportunity to walk around and view skaters throughout the park. It's a facility that people of all ages can enjoy. That's the way designer Doug Nelson wanted it. "We wanted to go with a real park, so we dealt with the physical concept of the area we were working with, and the type of skating done in the area. We wanted the park to relate to everything. and we wanted to do something good for the community." One thing unique about the four-acre skatepark is that it's located on the side of a hill. The general surroundings of the green hills give you the feeling that you are in Hawaii. The astroturf lining the skating area throughout the park strengthens that feeling. Pretty Dana Fried (below left) will be glad to assist you at the Aloha Surf Shop. She is one reason why Aloha has a great atmosphere. Aerials are nothing new to John Morgan (below right). He is always finding unique ways to attack the Canyon. Brad Meyers (above) also attacks Aloha's Canyon and shows why he's a top rad rider at the park. Presently. there are four skating courses highlighted by the Canyon, with a 6000-foot freestyle area and two large pools with coping planned for early summer 1978. The Canyon is a true challenge. Its 430 feet long with a 15-foot vertical wall, a U-shaped tube, and seven vertical bowls. You have to be quick in the Canyon, because once you're out of one bowl, you're faced with another . A local skater, 13-year-old Brett Ross, had one word for the Canyon: "Outrageous!" That might be an understatement. There are many ways to attack the Canyon, but be ready for a mind-blowing experience. Aloha Skatetown also offers a 12-foot-deep bowl with special side drop-offs. Here you can get rolling and slide right into the 80 x 38-foot-wide bowl for more hot skating. The other two courses-12S-foot wal1ows and spaghetti runs-are basical1y for beginners, providing some hot skating but on a lower level of difficulty. By viewing the park as a whole you can see that a lot of planning went into the project. "We did a lot of research, " said Nelson. "We wanted to know what would work. We talked to skaters, went to other parks, and consulted some professionals before we decided what to do. We wanted to come up with a basic plan, and we wanted to see what percentage of skaters there were in certain things and what their ability was. So far, I'm really happy with it." 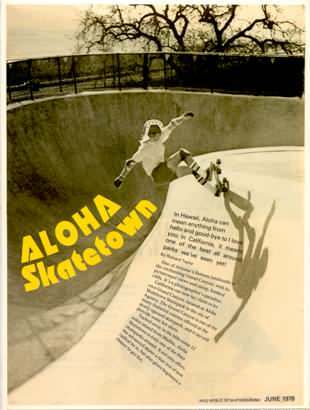 John Morgan (below left) tries one-wheeling at Aloha Skatetown. John is a local skater who goes for it in the Canyon with reckless abandon. A beginner's course is also offered at Aloha for skaters like Brad Edwards. If you're a novice, you can practice hot moves on this course. John Morgan gets above the devastating walls of the Canyon while completing an aerial. Ross was excited about the park also. "It's a smooth, easy-flowing park. It's outrageous compared to other local parks. And the Canyon is totally vertical." His friend Jeff Morgan echoed these thoughts. "I like the vertical pointed tops of the Canyon. You can do a lot of things. You get a lot of speed because it's on a slope." Jeff's brother John, who works there, also likes the park and contends that it's right up there with similar facilities. Another innovation added to Aloha deals with its $4000 sound system. With speakers located throughout the park you can get radical while you rock. And Nelson says that some skaters bring their own cassette tapes to listen to, a practice he encourages. We at wws think this is a good idea because it adds class to the park. If you haven't seen the latest in surfing and skateboard equipment, you'll find it at the Aloha Surf Shop, which is adjacent to the park. Adjoining the shop is the Sega Center Arcade, complete with air hockey, new pinball games, and the latest in the world of pong games. If you're waiting to skate or have just finished a session, you can relax in either one of these places or fill up at the snack shop. Another first is the color of the skating surface. It's light red, and according to Nelson it doesn't have as much glare as white pigment. He also noted that it stays cooler in the hot months. The surface area is lined with netting to stop flying skateboards, and also has vinyl fences painted green. Nelson and his co-designer Bill Drulias have come up with a super skatepark with a special twist-where else can you get vertical in the Grand Canyon?